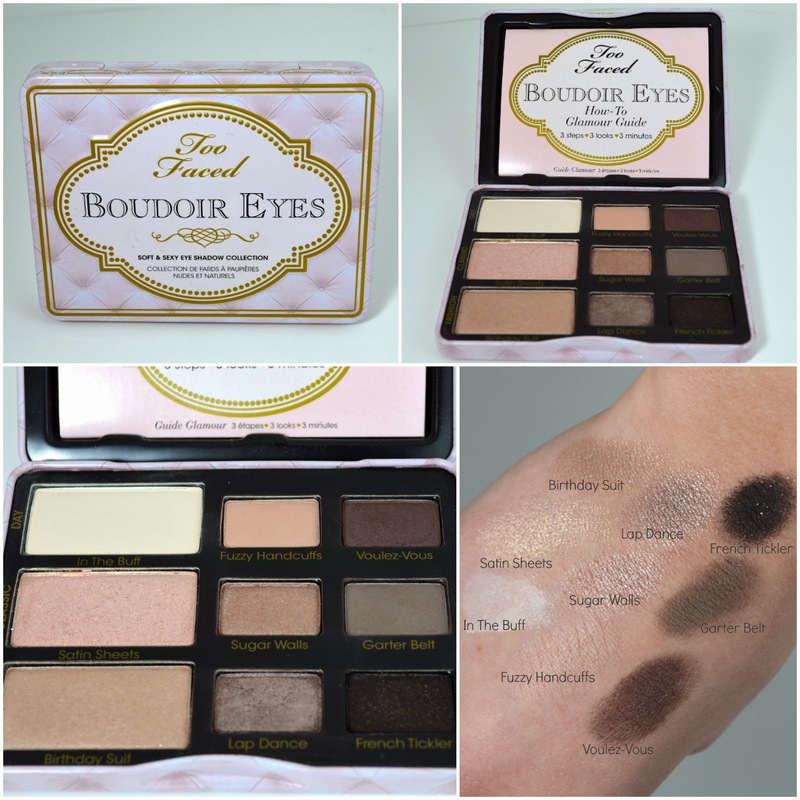 After falling in love with the shade "Satin Sheets" from Too Faced, I was all over the Boudoir Eyes palette when it was released about a year ago. For my greenish brown eyes, this palette works perfectly for achieving any type of look. The palette itself is about 3x4 inches and is enclosed in a metal box with a magnetic clasp. In place of a mirror, there is an inspiration/how-to booklet included inside the palette. I love the durability of the metal casing and lack of useless applicators or excessive cardboard. In this photo I tried out the class look, using the three shades from the palette and following the booklet tutorial for the classic shades. Amazing pigmentation and beautiful application. The only difficult part is not using too much product when dipping into the darker shades. Very long-wearing, but only when an eyeshadow primer is applied beforehand. Gorgeous quality shadows and very unique colours, but remember to blend out and avoid over-application. I love how there is a super dark and snazzy matte black that can be used as an eyeliner shade. Very functional. Great packaging! Durable, lightweight and beautiful. I wouldn't mind an added travel sized brush (not sponge-tip) since the Too Faced brushes are supposed to be very nice. Although considering the price, I wouldn't want to pay more for that. Where high-end eyeshadow is concerned, this palette is a pretty good value. With shades ranging from very light to very dark, I have no complaints. There are no duds and they are all very high quality and unique colours. for $45 CAD, this palette is suited for those who would reach for it frequently. Overall, this palette receives an A rating. I hope this review was helpful, keep smiling!